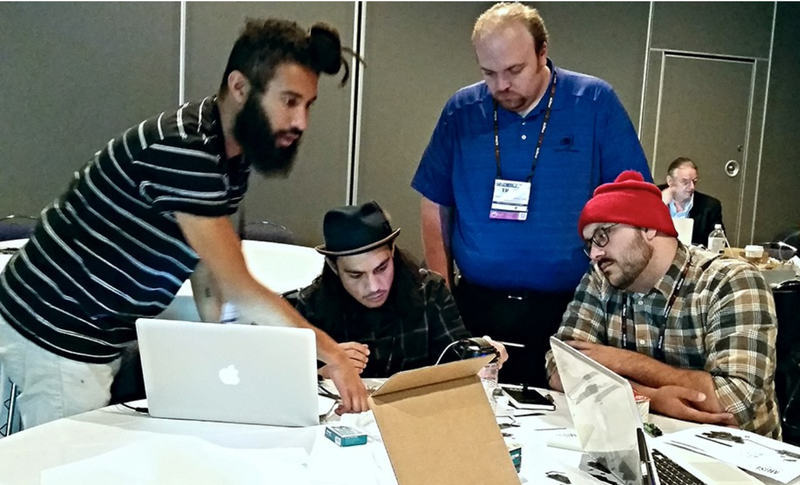 We brought the museduino to ASTC and you’ll never believe what happened next! I’ve always wanted to open a post with that, although I should have begun by thanking Paul for the generous invitation to guest blog at ExhibiTricks. I’m writing from Albuquerque, NM, where in addition to being a professor of Media Arts & Technology at New Mexico Highlands University, I run a small, semi-official lab called the CTDL (Cultural Technology Development Lab) with 5 fabulous collaborators. We hide out in a room behind the Mars Rover exhibit at the New Mexico Museum of Natural History & Science, devising solutions to make exhibits robust, less expensive, more open, and easier to update & repair. Bring us a problem- small museums, larger museums, national parks, libraries, NGOs; and we‘ll come up with something along the proof-of-concept to finished piece continuum. From this lair comes the museduino, an open-source kit for building robust electronic-based interactive exhibits. Its history lives here and here on Medium, and its schematics, PCB files, tutorials and projects live on WordPress and Github. 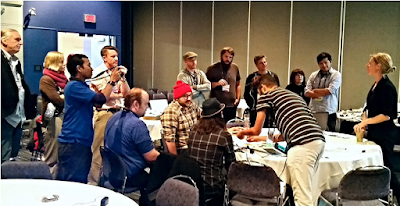 In this post, I’ll write about our first public rollout, at an ASTC pre-conference workshop on October 17th, 2015. We were thrilled to have a workshop filled with 12 engaged participants from around the US, Canada, and even Malaysia (we were also handed a 13-person waiting list with no contact information! Please get in touch, waitlisters!) Experience ranged widely - from “I’ve designed my own PCBs”, to “none, but but very enthusiastic”. This diversity is welcome, and why there are four of us in any workshop with more than 6 people. We began with an introduction on why we care about open hardware for exhibits. Pretty much everyone nodded along while we addressed issues around maintenance, cost, and the need for rapid prototyping and in-house development whenever possible. Rianne and Miles demonstrated museduino projects for Acadia National Park and The Carlsbad Museum, to show pre- and post-museduino implementation. Every workshopper was able to set up their museduino kit to extend the pin footprint of the arduino board to an LED. Each table then added a switch, in order to see how the satellite boards could be as far as 30 meters (100 ft) from the main shield with no visible sensor/actuator delay or voltage drop. This is very important if you are trying to cover a lot of distance. When it was time for group projects, we handed out motors, motion sensors, photoresistors, flex sensors, speakers and many LEDs. The group below designed & built (in 45 minutes) a proof-of-concept for a timed-running exhibit; visitors run a distance of ~80 feet; IR Sharps (infrared sensor) sense where they are in the “race”, giving encouragement and collecting data along the way. This version played a victory tune at the finish line. Maker-based learning was a major theme at ASTC this year (perhaps it is every year, but this was my first time attending the full conference). 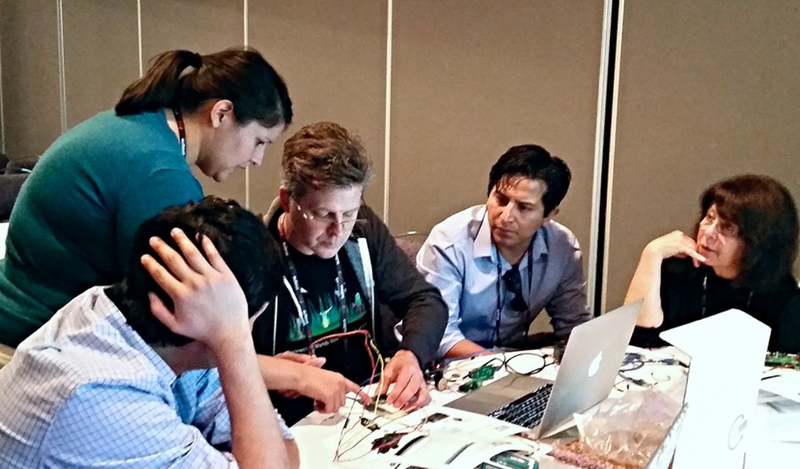 While maker/tinker/hacker/spaces may have varied pedagogical and logistical approaches, when it comes to electronics and microcontrollers, open source and arduino-based boards reign. What better platform to build a robustifying system for, than the one that young makers grow up learning? 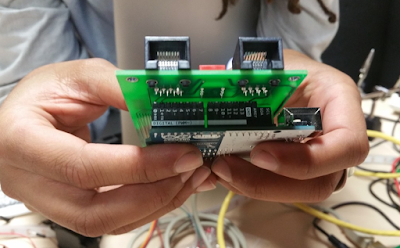 Our goal was to allow makers to have an accessible solution available when their tinkering project moves out of the prototype stage and in to a working long term stage. 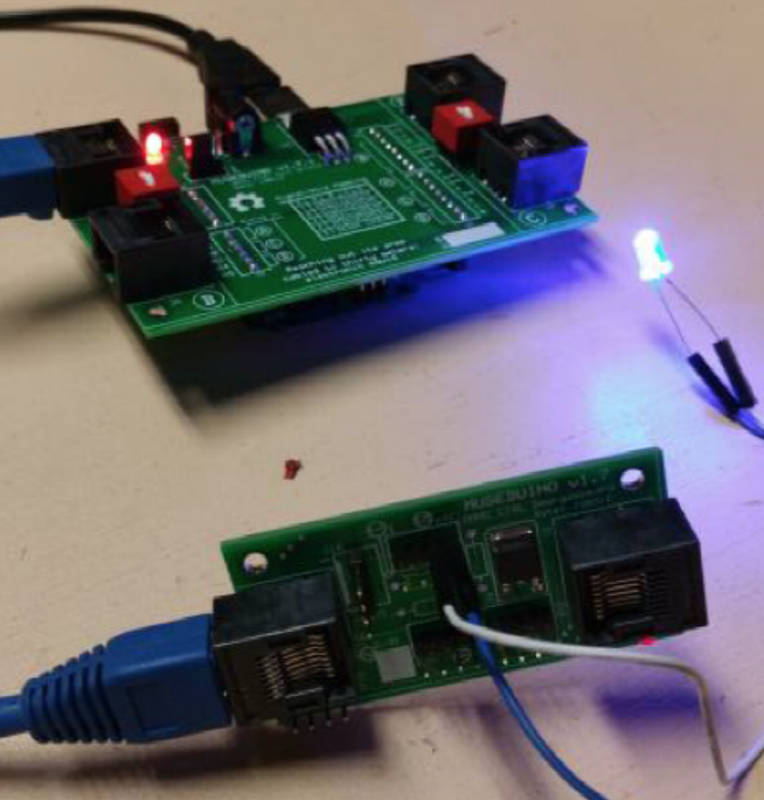 The Museduino shield works for most microcontrollers that use the Uno pin configuration (there’s a list in the blog post & WP site); we’re developing an even larger shield & satellite system for those of you that absolutely must use a Mega.